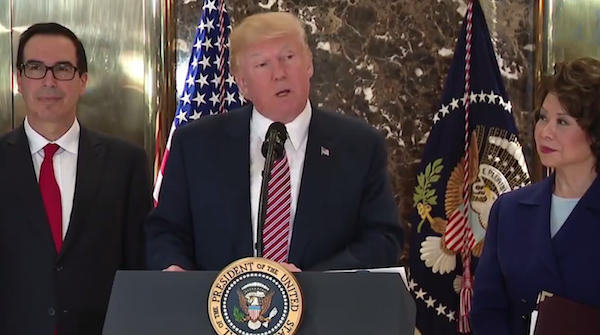 President Trump’s heart goes out to all those affected by the events in Charlottesville last weekend. The President condemns in the strongest possible terms this egregious display of hatred, bigotry and violence. No matter the color of our skin, we all live under the same laws, we all salute the same great flag, and we are all made by the same Almighty God. We must love each other, show affection for each other, and unite together in condemnation of hatred, bigotry and violence. 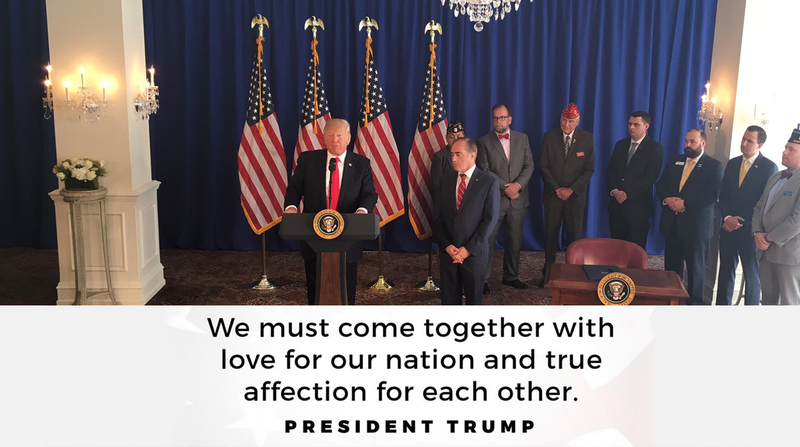 We must rediscover the bonds of love and loyalty that bring us together as Americans. Racism is evil. And those who cause violence in its name are criminals and thugs, including the KKK, neo-Nazis, white supremacists and other hate groups that are repugnant to everything we hold dear as Americans. 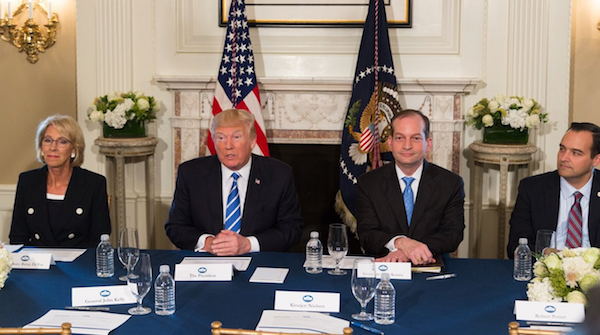 President Trump held a workforce and apprenticeship discussion in New Jersey. Under this President, we began a historic initiative to expand apprenticeship and workforce training programs in all industries. That was just the start, the administration is taking additional steps to expand apprenticeship programs, especially for women and minorities in STEM fields where these groups have been truly under-represented. In the past 7 months, we have made enormous gains in getting Americans back to work. Unemployment is at a 16-year low, and manufacturers have never expressed more optimism about the future. President Trump is making veteran healthcare a priority of his Administration and has moved quickly to improve the Department of Veterans Affairs healthcare system. When President Trump signed the VA Choice and Quality Employment Act, he gave veterans a choice in the healthcare they receive so they can receive the right care, at the right time, from the right provider. “In just a short time, we’ve already achieved transformative change at the VA—and believe me, we’re just getting started,” President Trump said. Vice President Pence traveled to Central and South America to meet with leaders from government and the business community to reaffirm the President’s commitment to deepening bilateral trade and investment ties with the region and to build on the good work that has been done to bolster our shared economic and security goals. Vice President Pence made it clear in Colombia, Argentina, Chile, and Panama that America first does not mean America alone. 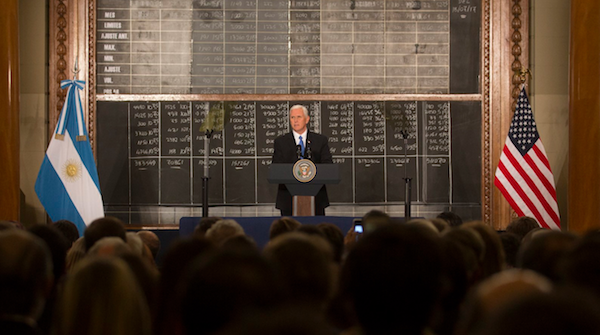 Our interests are aligned, our values are the same, and the birthright of Freedom belongs to both our people. 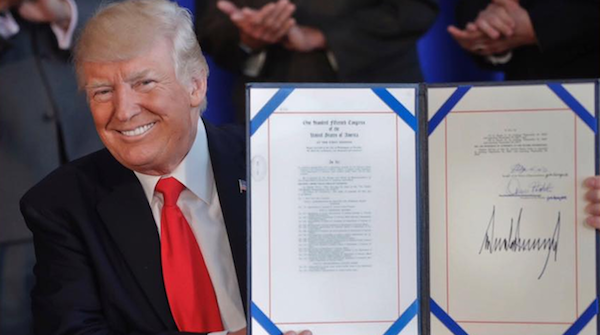 President Trump is taking the 1st step to ensure we protect American innovation and the intellectual property (IP) of American companies. IP theft directly harms the American economy and American workers. 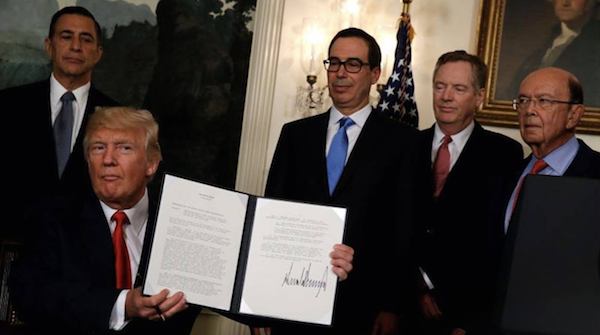 Reports suggest that China has greatly benefited from the theft of American IP, in some cases forcing American companies to transfer their innovation to benefit China. President Trump is following through on his promise to the American people to protect their IP so they can benefit from their innovation. Infrastructure is a priority to the President and he took action this week to rebuild America by signing an Executive Order establishing discipline and accountability in the environmental review and permitting process for infrastructure projects. With regulatory Red Tape to cut through, major infrastructure projects are held up for years at significant cost to our economy. Crumbling US infrastructure will be replaced with new roads, bridges, tunnels, airports, and railways gleaming across Our Land. President Trump’s plan to Make America Great Again is working! One million jobs created, unemployment is at a 16-year low, the stock market at an all-time high, and the military is at its strongest. 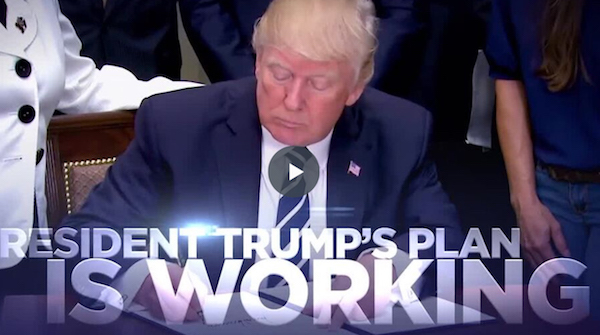 Let our President keep doing his Job and watch our new campaign ad by clicking here.